I've been in Poland training with Chen Ziqiang in a series of seminars organised by Marek Balinski, chief coach of the Warsaw Chen Taijiquan Academie. Chen Ziqiang was assisted by Wang Yan, captain of the Chenjiagou Taijiquan School's fighting team. He was featured in my post a month or so ago leading the school to victory in their recent challenge match with a team of Thai boxers from Thailand. These are some impressions from the week. First up was two days of sanshou and tuishou training in the Polish Wushu Association's purposely fitted combat sports facility. Chen Ziqiang explained the four different types of tuishou: first, the five standard drills - single hand, double hand, forward and backward stepping, big step and flexible step. These exercises teach many of the core skills necessary for combat in a fixed and controlled way. 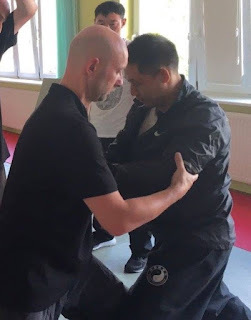 The standard drills are enough for students whose main purpose in learning Taijiquan is for health and fitness; second, is what Chen Ziqiang described as "experimentation". Working from the preceding drills practitioners train the different qinna and application potentials, again in a controlled way; third, the stand up grappling that he said is often mistaken for Taijiquan sanshou (free fighting). This type of push hands training starts with both players being in contact with each other and from that position train mostly rooting, throwing and sweeping skills; the fourth type is sanshou, where two people stand apart from each other and then bridge the gap. In sanshou every type of techniques can be used - striking, elbowing, kicking, throwing etc..
Over the two days Chen Ziqiang systematically moved between applications from standard push hands drills, to line drills that focused on the footwork supporting techniques. Finally, training the same techniques on kick shields so that the group could practice applying with full power. Like all excellent coaches he managed to get important concepts across while the sessions were in progress: keeping the shoulders loose in order for the arms to turn freely; sinking the elbows to guard the ribs; maintaining awareness of correct timing and distance; how to change the fighting range; flexible footwork etc... ; even touching on the study and practical use of pressure points to support qinna. There was a day to review the early part of the Laojia Yilu. 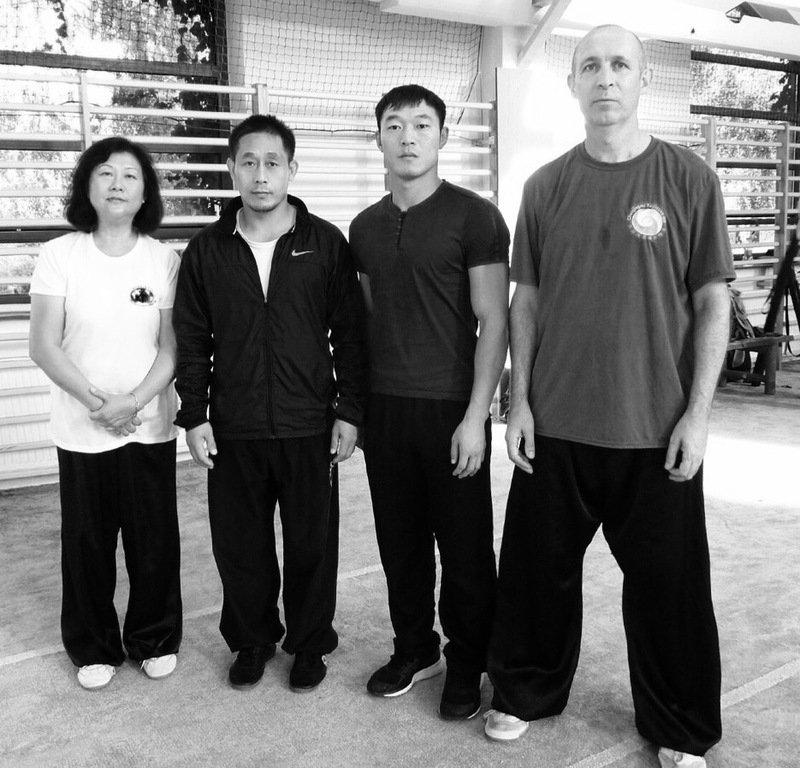 When Chen Wangting created Taijiquan the idea was to develop an effective martial system. Chen Ziqiang stressed that everything within the form has its function and purpose and that no detail should be overlooked. From the starting position external aspects and internal energy are harmonised via the intention. Hands, eyes, body and footwork are coordinated. He stressed the need to look beyond your hands when doing the movements, giving the simple example that if you were punching someone you would look at them and not at your own fist. Anyone who has trained with Chen Ziqiang will have experienced his physically challenging warm ups. During several of the sessions over the course of the week he handed the warm ups over to Wang Yan. Anyone feeling relieved soon changed their minds. Chen Ziqiang remarked laconically after one particularly strenuous session that "my student's warm ups are harder than mine". Our Polish visit concluded with three days of spear training. Chen Ziqiang places great emphasis upon exercises to develop basic skills. Just as a knife, fork and spoon each has its own function and usage, every weapon has its own characteristics that must be manifested. He recalled how he had trained the jibengong (foundation exercises) for weapons for several years before being allowed to train the forms. While this may not be practical for many students today, it does point towards the need to pay more attention to training the core skills of each weapon rather than just running through the forms. Chen Taijiquan's spear form marries the qualities of both spear and staff - the spear elements being straight and staff movements circular. "Spear" techniques emphasise thrusting (zha), blocking (lan) and intercepting (na). Staff techniques are built around the ability to turn the weapon like two wheels on either side of the body and not done as if you were paddling a canoe - a mistake Chen Ziqiang said is made by the majority of people training the spear. 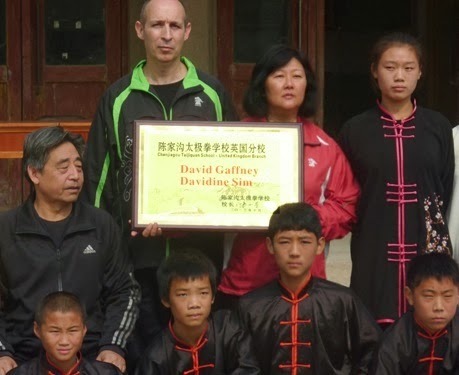 Development in Taijiquan is a continuous process, realising the connections between all aspects of the system and putting them into practice on the training floor.